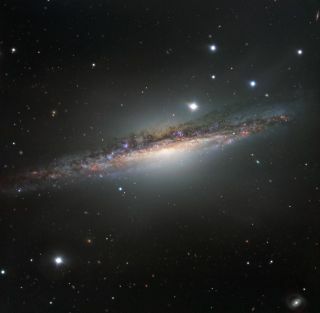 Edge-on view of the spiral galaxy named NGC 1055, which lies about 55 million light-years from Earth in the constellation Cetus (the Sea Monster). The best way to find laser flashes from an alien civilization is to look everywhere, all the time, and a new project aims to do just that. The SETI (Search for Extraterrestrial Intelligence) Institute in Mountain View, California, has released details of the effort, which it calls "Laser SETI: First-Ever All-Sky All-the-Time Search." The first flash from the group is that it has launched a crowdfunding drive to support the project via the website Indiegogo, which you can read about here. Though Laser SETI is cost-effective, astronomy-grade cameras must be purchased and optics fabricated, SETI Institute researchers said. The organization aims to raise $100,000 via the crowdfunding campaign, which runs through Aug. 18. Aliens: On the air, all the time? "The universe we call home is vast!" said SETI Institute president and CEO Bill Diamond. "It's also nearly 14 billion years old, so it's very difficult to imagine that we are alone. Yet extraterrestrial life still eludes our efforts to find it. Now you have a chance to be a part of the technology that can change that forever." For the last 50 years, whether the extraterrestrials are wielding massive radio transmitters or high-powered lasers, astronomers carrying out SETI experiments have assumed that the aliens are on the air, all the time. "But that might not be right," Diamond said. "After all, would these otherworldly beings relentlessly target our solar system if, like the overwhelming majority of galactic stars, they're more than 100 light-years away — far enough that they haven't learned we're here, because our own signals haven't yet reached them?" Laser SETI is the first experiment to circumvent this assumption, Diamond adds, "because it's designed to find a very short ping that doesn't stay on all the time — it can detect a laser flash as short as a microsecond, and one that might not repeat for days, weeks, or even longer." Laser SETI on Indiegogo from SETI on Vimeo.